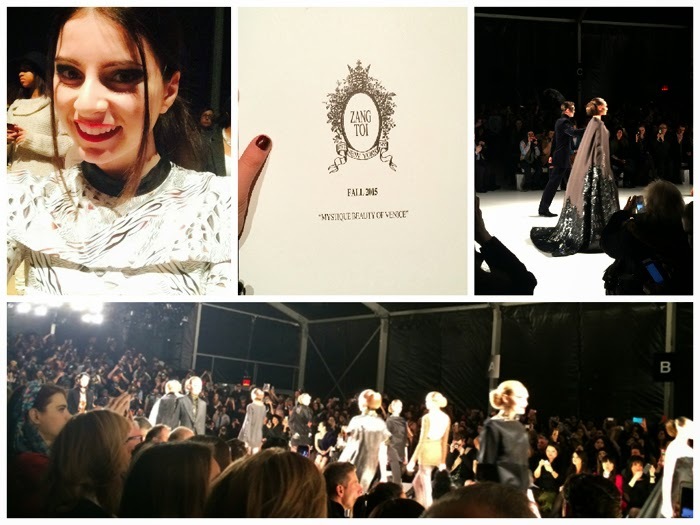 Every season for the past few years I’ve been lucky to be invited to Zang Toi’s fashion show. Anyone who’s seen his work can attest to the fact of how fortunate they’re to get a live glimpse of the granular details, sparkles, feathers, luxe furs and any other befitting decorations that adorn his many works of art. Work of art is certainly an ideal word to describe a Zang Toi design. His Fall 2015 collection ever so perfectly captured the romantic and mysterious essence of Venice. Appropriately titled “Mystique Beauty of Venice”, the collection demonstrated Zang’s heavy weight craftsmanship through each majestic Italian themed look. 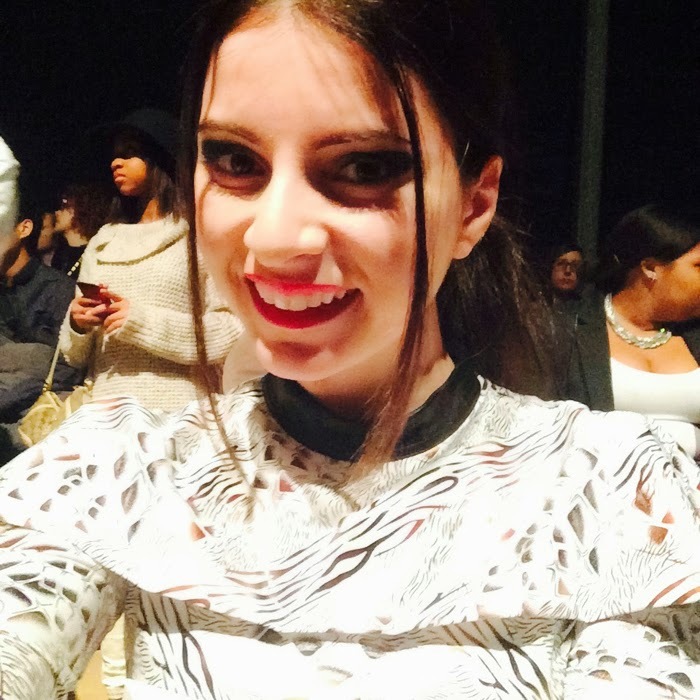 Before the start of the fashion show, I snapped an excited selfie in my seat. I couldn’t wait to see what Zang had in store for Fall 2015. VeVe, Zang’s lovely PR Director waved hello as he walked by. I was also in good company with our mutual friends Frances and her awesome husband, JD. It was great to catch up with them before the start of the show. The fashion show began with a beautiful melody from Tu Sei by Vittorio Grigolo. A stunning deluxe taupe lamb classic twin set with a black murano glass necklace and a black georgette fortuny pleated maxi skirt opened the show. Venice was further personified through Zang’s homage to Turner’s Grand Canal, The Dogana as well as the San Giorgio Maggiore. Luxury reigned supreme with Zang’s use of silk gazar, Loro Piana fabrics, brocades from a 300 year old Italian mill, murano glass, leathers, cashmere and Swaroski crystals. The grand finale piece was an exquisite taupe silk gazar opera cape with hand-beaded black sequins and a black diamonds nightscape of Venice. My i-phone photo doesn’t quite do the piece justice so I encourage you to check out the video below for a better look of it as well as Zang's entire stunning "Mystique Beauty of Venice" collection!